Key Takeaway: Al Qaeda is growing stronger in Southern Syria. An assassination campaign targeting mainstream opposition commanders and governance officials is facilitating al Qaeda’s consolidation of power along the borders of Jordan and Israel. Southern Syria stands at increasing risk of becoming a second Idlib Province, which currently serves as a formidable safe haven for al Qaeda. Syrian opposition forces that could serve as a viable alternative to both Syrian President Bashar al-Assad and Salafi-jihadist groups are under attack in Southern Syria. A recent wave of assassinations beginning in August 2017 has killed over eleven ranking anti-regime opposition commanders and governance officials in Dera’a and Quneitra Provinces. These assassinations have remained largely unclaimed. The unidentified perpetrators have targeted armed and political opposition officials using car bombs, roadside improvised explosive devices, and armed gunman. Of the forty-two attempted assassinations observed by the Institute for the Study of War (ISW) from August 5 to November 21, 2017, approximately fifty-five percent successfully killed opposition fighters, commanders, or governance officials. More than half of the attempts targeted former or current U.S.-backed opposition groups. The Assad regime and the Islamic State of Iraq and al Sham (ISIS) are likely responsible for many, but not all, of the assassinations in Southern Syria. Al Qaeda may leverage the wave of other attacks carried out by ISIS and the Assad regime to conceal its own covert campaign against the opposition. Al Qaeda’s Syria affiliate Hay’at Tahrir al Sham (HTS) likely seeks to exploit the deteriorating security situation in Southern Syria to advance its own covert assassination campaign against rival governance structures and armed opposition groups.Al Qaeda dispatched over thirty senior officials to reinvigorate its efforts to embed within the opposition in Southern Syria in May 2017. The areas currently experiencing the most concentrated number of assassinations overlap with the regions where al Qaeda conducted significant governance outreach in Southern Syria since 2016. Of the forty-two assassination attempts recorded by ISW in Southern Syria between August 5 and November 21, 2017, at least twenty-six occurred near the towns and villages where al Qaeda previously conducted governance outreach. The targets also increasingly include governance structures competing with HTS. At least four senior jurists from the opposition Dar al Adel Court were targeted by assassination attempts in October 2017, including the successfulassassination of Dar al Adel Executive Force Commander Omar al Mafa’alani on October 9. The spate of assassinations ultimately forced the Dar al Adel Court to cease its operations for a week on October 28. Al Qaeda has previously capitalized on a similar security environment to undermine and coopt armed opposition groups and affiliated governance structures in Idlib Province. Idlib Province once stood as a stronghold of the Free Syrian Army (FSA) just as Dera’a Province is currently dominated by the FSA-affiliated Southern Front. Al Qaeda’s consolidation of power in Idlib Province was preceded by a series of assassinations targeting opposition commanders and governance officials in Idlib Province. Al Qaeda sought to marginalize U.S.-backed opposition groups and remove opposition leadership that would be resistant to mergers and joint operations rooms with Al Qaeda during this campaign. 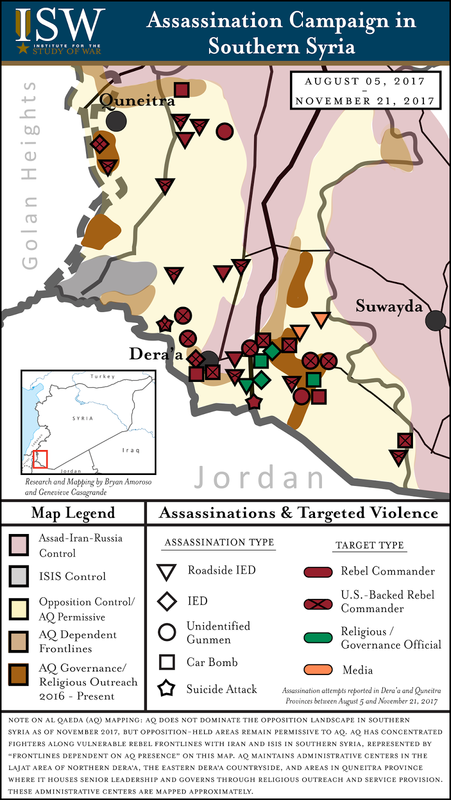 Al Qaeda launched targeted operations against opposition groups backed by the U.S. in Idlib Province – specifically the Syrian Revolutionaries Front (SRF) and Harakat Hazm – beginning in July 2014. These shaping operations preceded the formation of the Jaysh al Fateh Operations Room in March 2015. 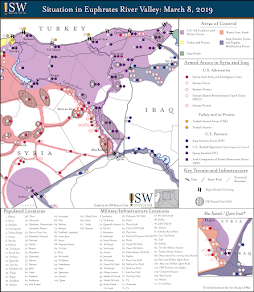 Al Qaeda acted through Jaysh al Fateh to effectively force the regime from Idlib Province by the end of May 2015. Al Qaeda exploited the success of these operations to fill the resulting governance vacuum and consolidate its control over a jihadist safe haven in greater Idlib Province in Northwest Syria. Al Qaeda also leveraged other Salafi-jihadist groups such as Jund al Aqsa to support its targeted attacks against the opposition in Northern Syria. The pattern of assassinations against U.S.-backed opposition groups in Southern Syria suggests that al Qaeda is seeking to replicate its success in Idlib Province. HTS could similarly facilitate attacks against opposition groups in Southern Syria by ISIS-affiliated groups or other jihadist splinter factions in order to maintain a low profile in Southern Syria. Al Qaeda seeks to marginalize remnants of U.S.-backed opposition groups in Southern Syria to create a sustainable power base along the Syria-Jordan border. An assassination campaign by al Qaeda could mark the first phase of operations to coopt opposition factions and covertly remove leaders that would oppose the formation of joint structures with al Qaeda. Al Qaeda likely seeks to disguise its assassination campaign among other attacks by ISIS and the Assad regime to avoid reprisals or local resistance from civilians and other opposition groups in rebel-held Southern Syria. Al Qaeda will also continue to obfuscate its efforts to embed itself within the local population in order to avoid triggering intervention by the West. The current U.S.-Russia-Jordan ceasefire in Dera’a and Quneitra Provinces provides a conducive environment for al Qaeda to lay the groundwork for its desired safe haven in Southern Syria. Al Qaeda also stands to exploit the decision by the Trump Administration to dismantle a covert program to support vetted opposition factions in Syria by December 2017. This decision will end the provision of weapons, training, and salaries for thousands of opposition fighters in Southern Syria even as opposition groups and governance structures are struggling to maintain basic security and infrastructure across Dera’a and Quneitra Provinces. The decrease in external support to non-jihadist forces will likely further embolden and empower al Qaeda in Southern Syria. ISW collected reports of assassinations from local activists’ reports in Dera’a and Quneitra Provinces from August 5 to November 20, 2017. The dataset curated by ISW does not represent a complete record of all assassination attempts during the reporting period in Southern Syria. The situation in opposition-held regions remains fluid with key gaps in local activist reporting from Dera’a and Quneitra Provinces. The following map does not represent attacks that only killed civilians, pro-regime forces, or the ISIS affiliate Jaysh Khalid ibn Walid. Of the attacks represented on the following map, approximately fifty-five percent were successful in killing opposition fighters, commanders, or governance officials. 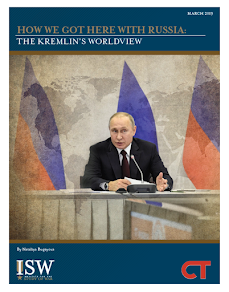 ISW defines the ‘mainstream opposition’ as the armed opposition groups opposed to Syrian President Bashar al-Assad that do not adhere to the tenets of Salafi-Jihadism. The label encompasses a spectrum of opposition groups that range from secular moderates aligned with the Free Syrian Army to political Islamists. These groups may or may not cooperate in military or governance structures with al Qaeda.